• Formative Assessments provide real time intervention progress and action-driven recommendations. • Small Groups are made for the teachers to help in planning and tracking small group intervention. 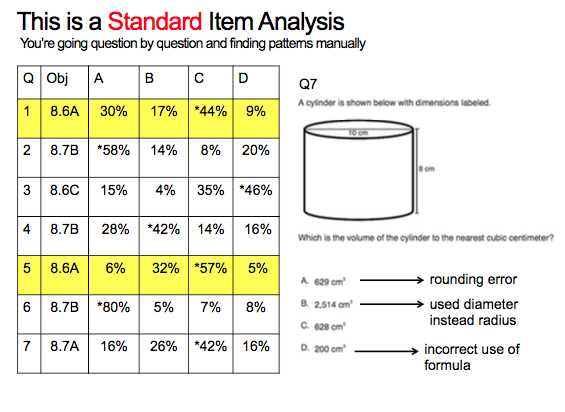 • Readiness Summary allows teachers to easily see student performance and misconceptions on a single sheet of paper. It allows teachers to find the most important concepts to teach for the biggest impact when time is limited. • Research-based assessment techniques identify students' strengths and areas of need and measure instructional effectiveness. Data Dash helps educators uncover and focus on misconceptions and distractors. Students are auto grouped by misconceptions to allow for differentiated instruction. • Data Dash eliminates the manual and long process of using a standard item analysis to automatically pattern incorrect answers.